"The best times you are going to have in life are at the dinner table and in bed." Old Italian saying. So relax, and enjoy the simple things! 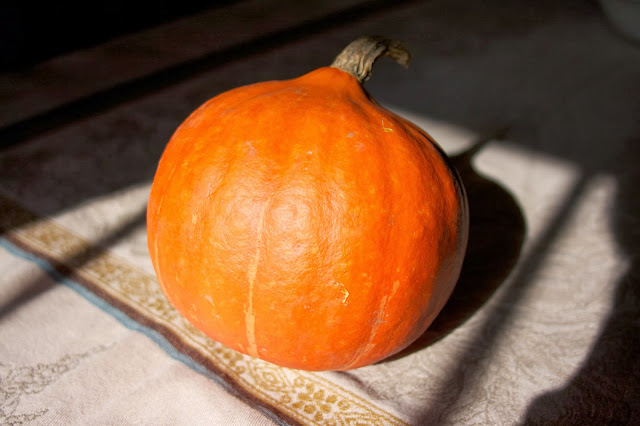 Red Kuri Squash is my new favorite squash. Why you might ask? Well, not only is it delicious… it less sweet more nutty, kinda chestnut like, compared to butternut squash…but what makes me the most excited about this vegetable is that you can bake it and puree it into soup without removing the skin. Yes, the skin cooks up and blends into your broth…no problem. How is that for convenience… and squash is such a great thing to eat this time of year… yes it is in season, and it is chock full of vitamin A which is evident by it's bright orange color. It is also rich in vitamin C which is also an important nutrient to get into your system during the flu season. 1) Pre-heat oven to 400 degrees. Halve and remove seeds etc from center of squash. 2) Baste inside of squash with EVOO and sprinkle with salt. 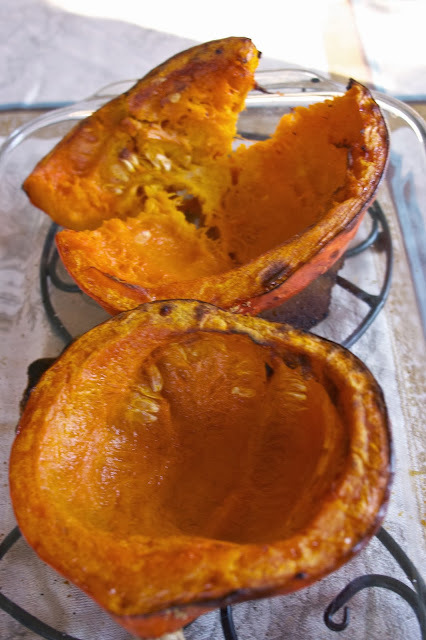 Place on a baking dish and roast for about 1 hour or until the squash begins to brown and is soft when poked with a fork. 3) While squash is baking sauté onion in about 1 tablespoon of EVOO in a large sauce pan until wilted. Add nutmeg and let bloom for about 1 minute. Remove from heat. 4) When squash is cooked add it the sauce pan skin and all, and pour in 4 cups of vegetable broth to start. Bring it to a boil and turn off heat. 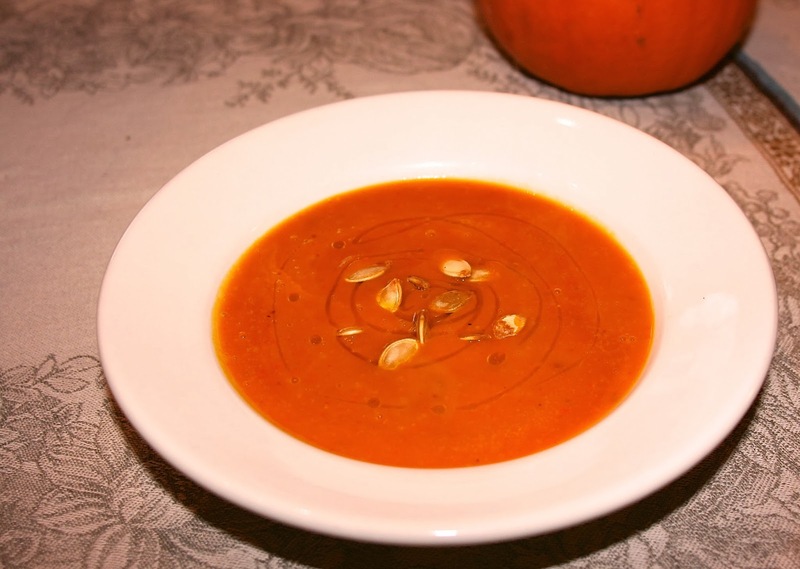 5) Either in small batches puree the soup in a blender or use an immersion blender on the stove. 6) Slowly add up to 2 more cups of broth depending on how thick you like your soup. Add salt and pepper to taste. 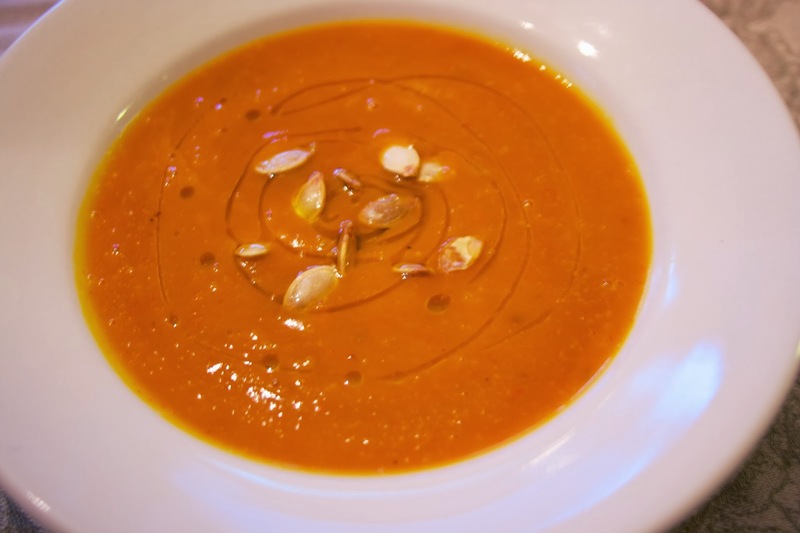 Choose from the list of garnishes… I put EVOO and pumpkin seeds on mine. It is great served with buttered crusty bread. So your a kuru squash fan… I'm not surprised. nice soup. I haven't yet tried Red Kuri squash. May be I should get some. Yes, pork goes well with the soup…enjoy. I have never heard of Red Kuri squash. I love that you don't have to take the skin off though! Post it on your sidebar to share were you visit. All content provided on this blog is for informational purposes only. The owner of this blog makes no representations as to the accuracy or completeness of any information on this site or found by following any link on this site. The owner will not be liable for any errors or omissions in this information nor for the availability of this information. The owner will not be liable for any losses, injuries, or damages from the display or use of this information. These terms and conditions of use are subject to change at anytime and without notice. All content on this blog is copyright 2016 All rights reserved.. Theme images by MichaelDeLeon. Powered by Blogger.